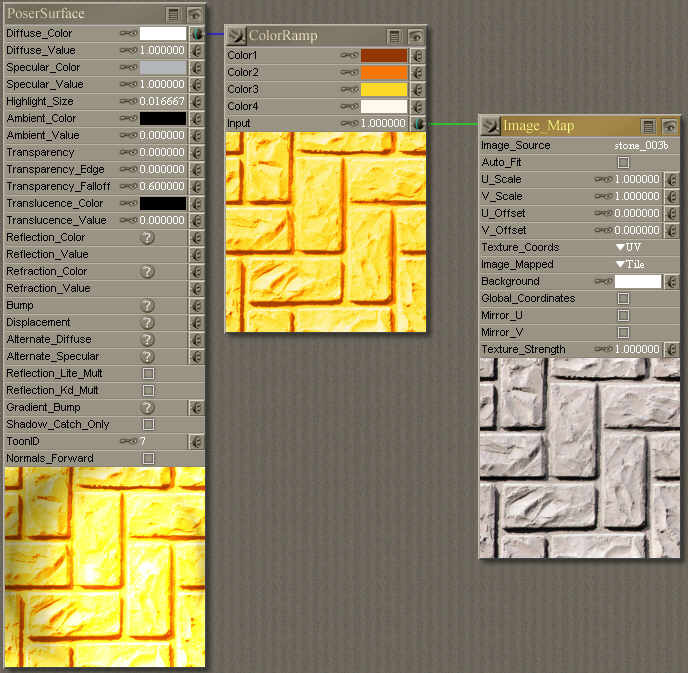 In this tutorial, we are going to take an existing texture and recolour it using two Material Room nodes. 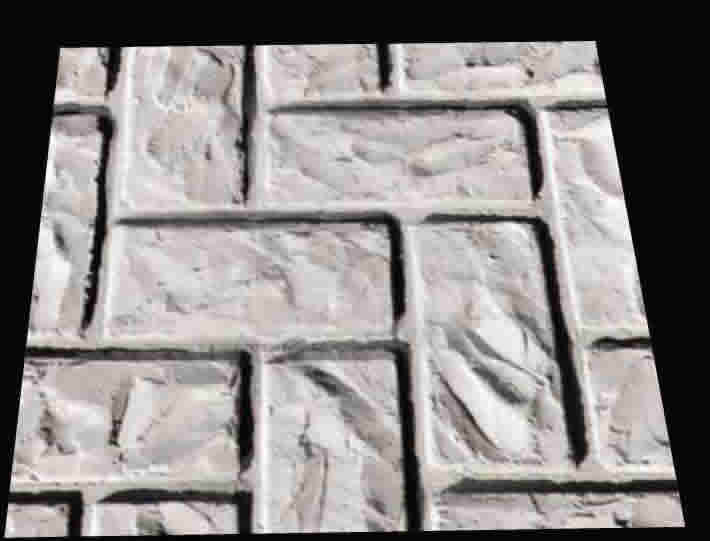 The texture we are using here is the stone3b tiling texture from www.environment-textures.com, a nice chunky light gray stone. 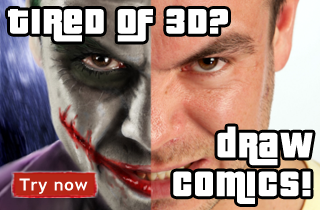 Here we see it applied to the poser hi-res square primitive. This shot shows our starting point. The output of the Image_Map node is plugged into the Input attribute of the ColorRamp node. 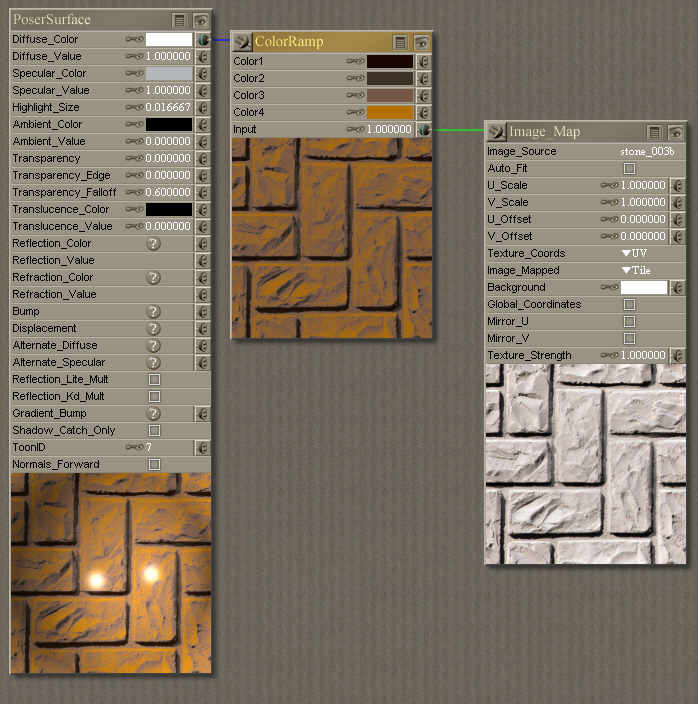 The output of the ColorRamp is then plugged into the Diffuse_Color input. With the default colours that produces a bright yellow result, not exactly what we are looking for! Here I have picked a series of browns, from almost-black at the top down to nearly orange at the base to give a warm brown result. This shot shows us the results of the color ramp. 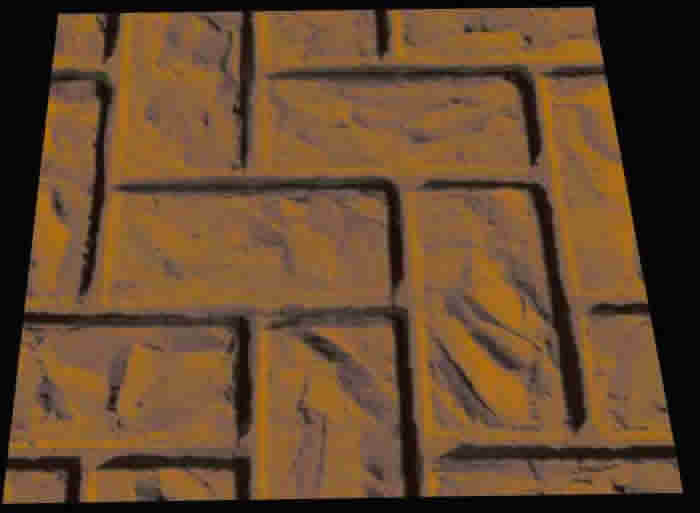 This technique greatly increases the flexibility of our textures, but we can do more. In this case, I'd like to see more detail on the surface of the stones. 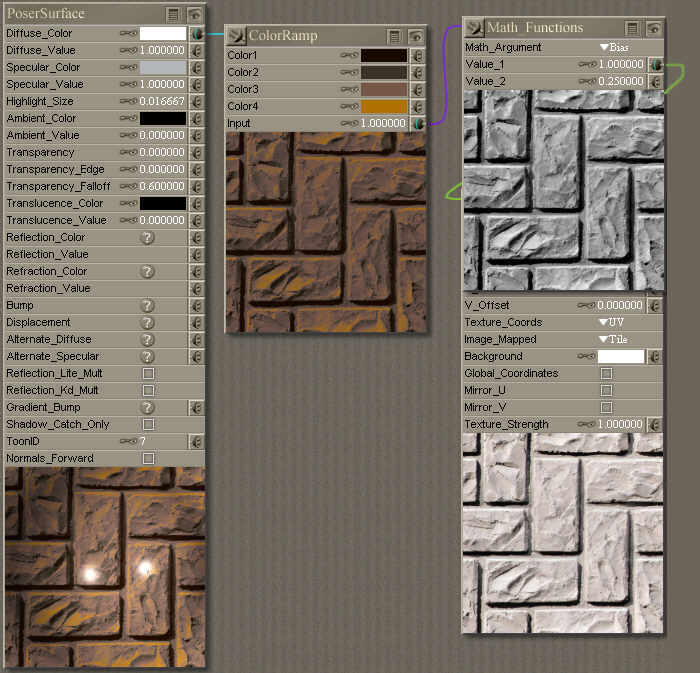 If we place a maths node between our texture and our ColorRamp Input we gain even more control over the final result. The two most useful nodes here are the Bias (Brightness) and Gain (Contrast) nodes. 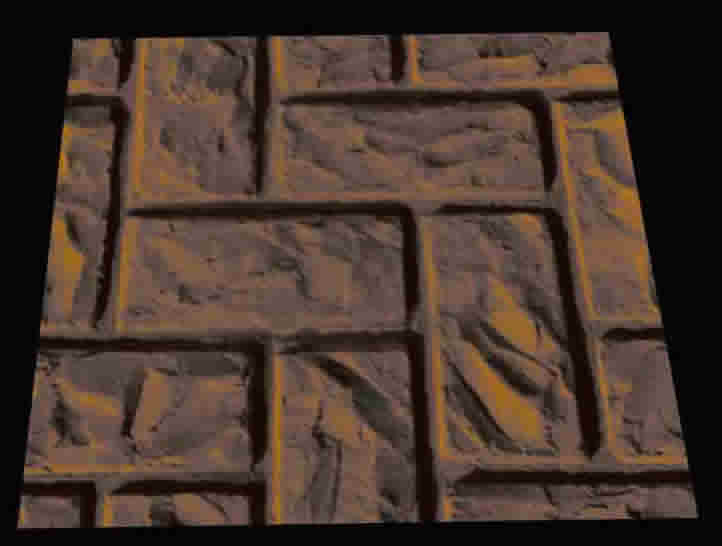 Here I am using a Bias node to darken the texture. To do this, create your Maths_Function as shown. Set the argument to Bias, Value_1 to 1 and Value_2 to .025. Our texture output is plugged into Value_1. Value_2 controls the Bias - 0.5 does nothing, low numbers darken the picture and high numbers brighten it. The Bias node still leaves very bright colours bright, so the result of decreasing brightness is often to increase the impact of highlights, while increasing brightness can make the dark patches look darker in comparison. Here is our final result. As you can see, the dark areas are still just as dark. However, the overall tone is darker, with bright highlights now standing out. There is now more detail showing on the surface of the stones.